After the climactic scene of the surrender at the Fort Motor Factory, the documentary film exhibits a series of events that were representative of the Japanese military’s psyche and mood after the completion of the conquest of Singapore. We would see desecrated landscapes, vehicles on fire, a dirtied flag of the Union Jack, a short moment of “banzai” and proceedings to commemorate the war dead. There is almost an attempt to avoid showing overt celebrations in the documentary. More time is indeed dedicated to the pertinent post-war matters – commemoration of the dead and remembrance of their sacrifices to the war effort, recovery of the Japanese civilians who had been interned by the British and the management of the prisoners-of-war. Acts of violence, such as the Sook Ching massacre which occurred within a few days after the surrender, are not represented though. The sequence of events depicted in the film suggests a peaceful and sombre transference of power from an aging British empire to the emergent Japanese imperialists. Atrocities are concealed from the public sphere. Propaganda at work. Commemoration of the war dead on a modest scale. Japanese soldiers who were killed in action were often buried at the battle sites and commemorated with grave markers and offerings such as flowers and wine. Before burial, their wrists would first be severed so that the survivors could return the hands or the ashes of the hands to their homes. The specific locations of the grave markers depicted in the film-stills above are not clear to me. The grave markers would also be temporary as the buried corpses might have been cremated at a later stage and the ashes housed in the shrine next to the Syonan Chureito (also known as the “Syonan Memorial to the Spirits of the Loyal Soldiers who died in the Battle for Singapore”), which was unveiled on the Bukit Batok Hilltop on 10 September 1942. Prior to the aforementioned 20 February memorial service, the Japanese army had already organised a commemorative parade of tank soldiers on the 16 February 1942. From the film-stills above, I can’t really make out the location of the parade. The soldiers were bearing the ashes of the war dead (in urns wrapped in white cloth hung around their necks) and readying themselves on a grass field before the tank convoys went on a procession around the Singapore city area. The procession of the tanks entered the Singapore city, passing the Padang. 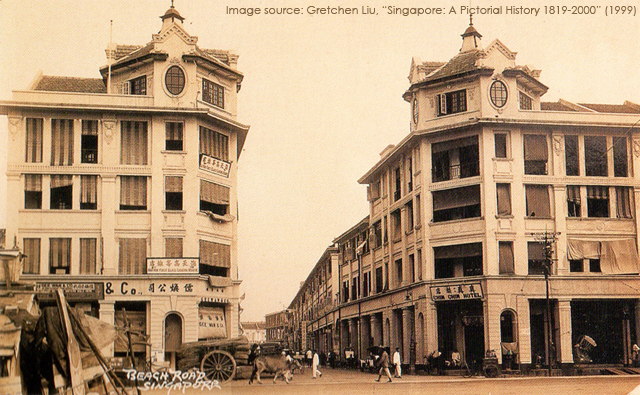 Upper left: Robinson Road, with Special Detective Branch Headquarters on the left and the Singapore Sailors Institute on the right. (Correction made on 26 Feb 2014). Upper right: The Supreme Court. Lower left and right: Dignified poses of the Japanese soldiers who bore the urns containing the ashes of their dead comrades in front of their chests. Consider the symbolic nature of such a gesture. No triumphal parade. Sombre procession of the dead and the living riding on tanks into the city area where there was a concentration of architectural icons of the British empire, the past masters. The tanks would parade pass the Raffles’ Statue in front of the Victoria Memorial Hall. It almost seemed like a march past for an abdicating leader. Soon, the statue would be taken down and stored in the Raffles Museum, and there was a plan to replace it with Yamashita’s statue. That, however, did not materialise. Raffles’ statue would be reinstated after the return of the British in 1945. The tank procession travelled to other places in Singapore, locations that I am not able to identify. It passed a John Little advertisement billboard, a building with “Sin Chew Jit Poh Ltd.” painted on its side, a non-descript village, and a colonial building (lower right). Which colonial building was that? Can anyone identify that building? 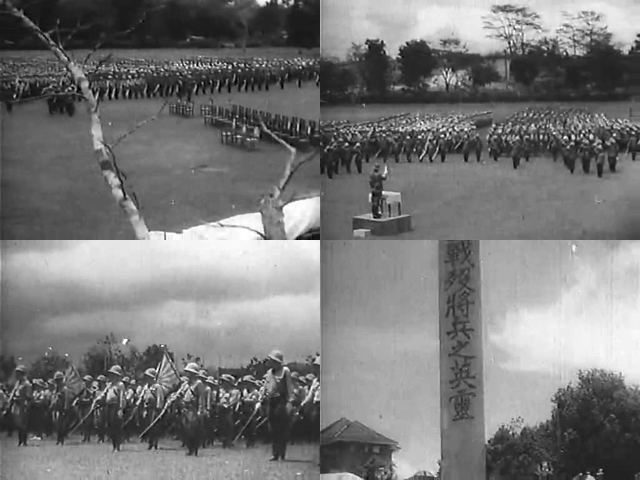 This group of film-stills from the documentary are of the aforementioned 20 February commemoration service under General Yamashita’s initiative. It was dedicated to the 3,500 Japanese soldiers who were killed in the Malayan Campaign. The location of the service depicted above was definitely the Raffles College grassfield, as the buildings depicted in the lower right film-still above matched the ones in photographs of Raffles College that were taken pre-war. 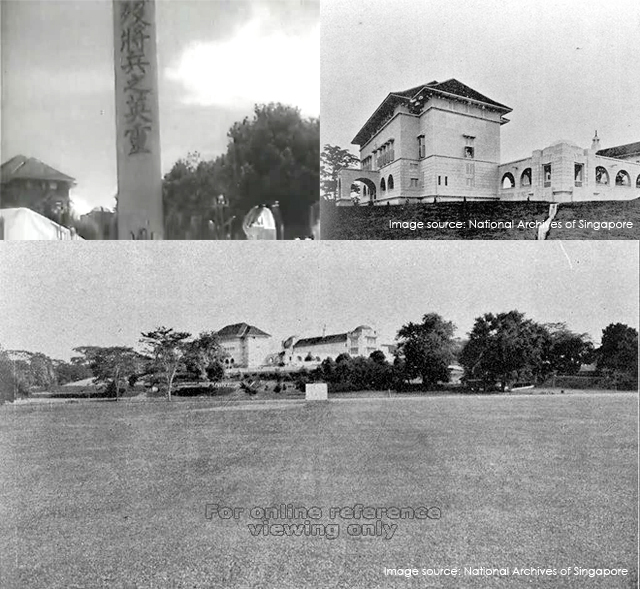 These 1938 photographs of the Raffles College Administration & Science Blocks and the grass field were extracted from the National Archives of Singapore. The Kanji characters written on the memorial in the film-still, “戰殃將兵之英靈”, may be translated as “Memorial for Spirits of the Valiant Soldiers who Died in Battle”. A grand memorial for the Japanese War Dead would be constructed on top of the Bukit Batok Hill and unveiled in September 1942. The ashes of the war dead would also be moved to this new memorial, named “Syonan Chureito“. The memorial was destroyed before the Japanese surrender in 1945 and only the ceremonial steps leading to the memorial and some base pillars remain at the site today. I visited the memorial site (now renamed Bukit Batok Memorial) was I was preparing for this blog post. As a matter of interest, I had also visited the Japanese Cemetery Park situated along Chuan Hoe Avenue, near Serangoon Gardens. There is a section in the cemetery that is dedicated to the war dead of the Second World War. The ashes of 10,000 Japanese war dead collected from the destroyed Syonan Chureito are also interred in the cemetery park. Used as a burial ground since 1891, it is supposedly the largest Japanese cemetery in Southeast Asia, consisting of 910 tombstones that contain the remains of members of the Japanese community in Singapore, including young Japanese prostitutes, civilians, soldiers and convicted war criminals executed at Changi Prison in Singapore. Burials at the site continued until 1973. It has since been gazetted as a memorial park by the Singapore government, and is currently maintained by the Japanese Association of Singapore. Two days after the surrender on 17 February 1942, some 45,000 Indian Army prisoners-of-war that had assembled at Farrer Park were addressed by Major Fujiwara Iwaichi (of the Japanese special operations unit F-Kikan) and Captain Mohan Singh, who was one of the first British Indian military officer to defect to the Japanese during the Malayan Campaign. Major Fujiwara had “recruited” Captain Mohan Singh after the defeat at Jitra and requested him to form an Indian Army comprising the captured Indian soldiers. It was the early beginnings of the Indian National Army (INA), which would become the military arm of the Indian Independence League (IIL). Film-stills from the documentary. The massive crowd at Farrer Park on 17 February 1942. 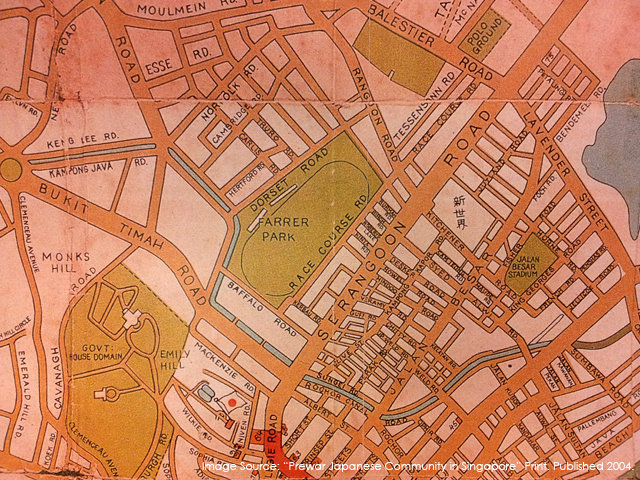 A pre-war map showing the location of Farrer Park. Farrer Park was the first race course built in Singapore and doubled as a golf course, grazing pasture and rifle range. It also served as an air strip for aircrafts landing in Singapore during early 20th century. After World War Two, it became a sporting arena for the masses and was a popular venue for political rallies during the post-war struggle for independence. Today, part of the Farrer Park open plains remains while the rest are redeveloped for public housing and commercial purposes. It is now a rather quiet and spacious “backyard” to the thronged alleys of Little India. Lower left: Sandbags stacked up at the entrance to the shops. Air-raid and artillery shelling precautions. Lower right: “Uyeda Shoten”. A Japanese bookstore. 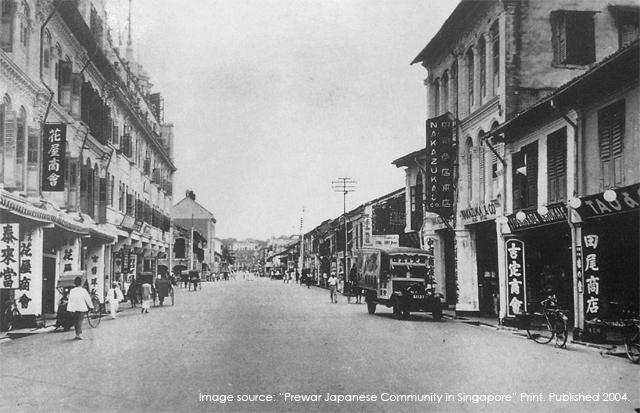 Could this be shot in Middle Road, a Japanese enclave before the war? One of the foremost tasks of the Japanese military after the British surrender was to free the Japanese civilian residents of Singapore, around 40 of them, held at Changi Prison since the outbreak of the Pacific war. The British Special Branch had rounded up all the Japanese nationals after the air raid on 8 December 1941 and interned them with the intention of sending them away to India. Prior to the sequence depicting the recovery of the Japanese civilian residents, the editor of the documentary had included two shots of the Singapore Japanese Elementary School (新加坡日本小學校) — one of the school gate and the signboard, and the other of a statue that presumably stood inside the school. The purpose of that might have been to make known the vicinity of the location of where the Japanese civilians would be recovered to. 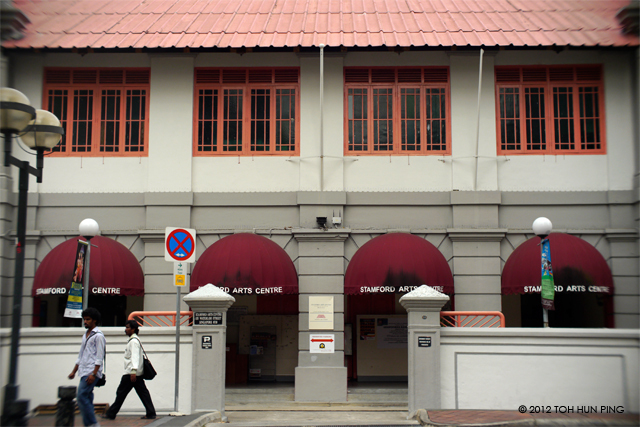 The elementary school had been located within the Japanese enclave, at the junction of Waterloo Street and Middle Road. 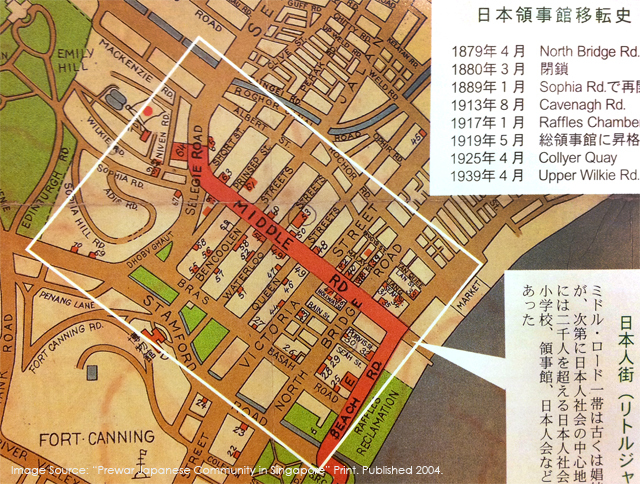 Pre-war map of Middle Road, the Japanese Street (日本人街). 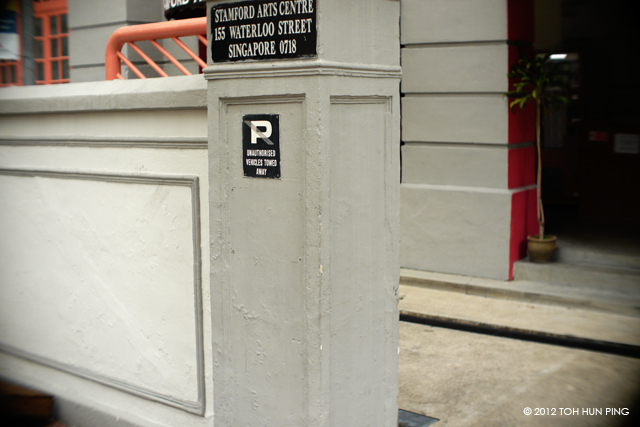 The Singapore Japanese Elementary School was marked no. 53. 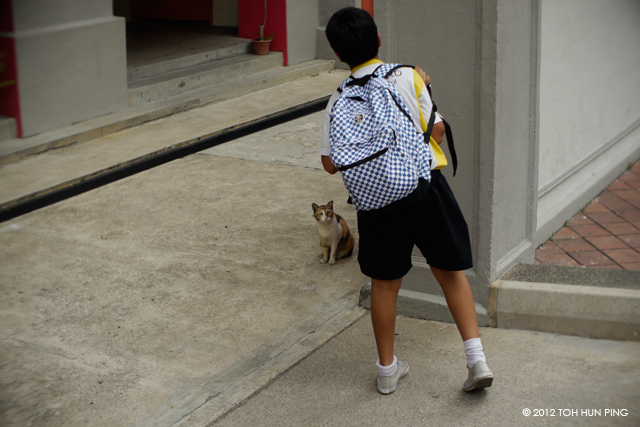 Two shots of the Singapore Japanese Elementary School in the documentary. 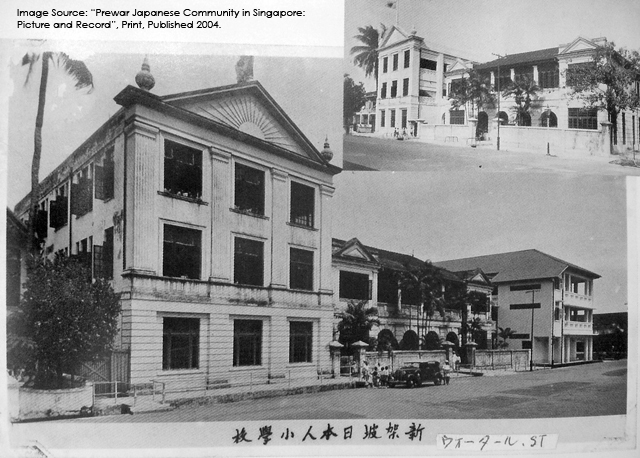 The former Singapore Japanese Elementary School. The current Stamford Arts Centre. The same gate pillar that was shown in the documentary. 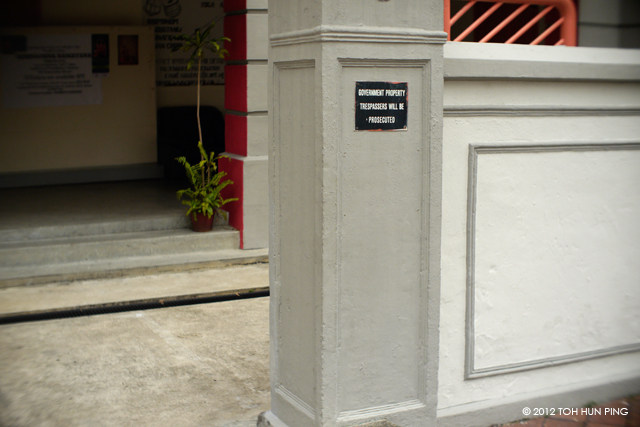 The other gate pillar with a sign stating the current name of the building and its address. The stoic cat and a curious onlooker. The Stamford Arts Center is where a number of performing arts troupes are based. 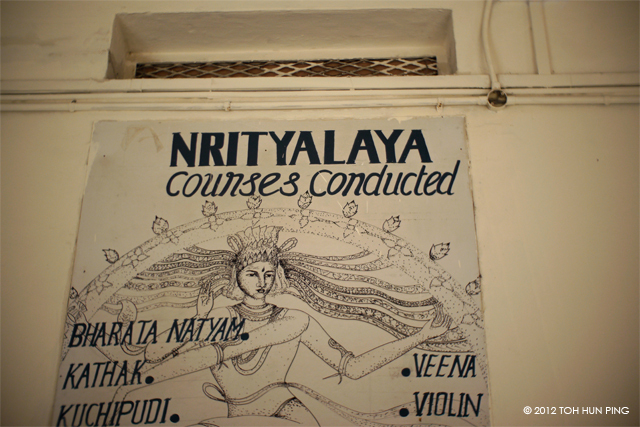 One of them is the Nrityalaya Aesthetics Society. It conducts traditional Indian dance and music classes. 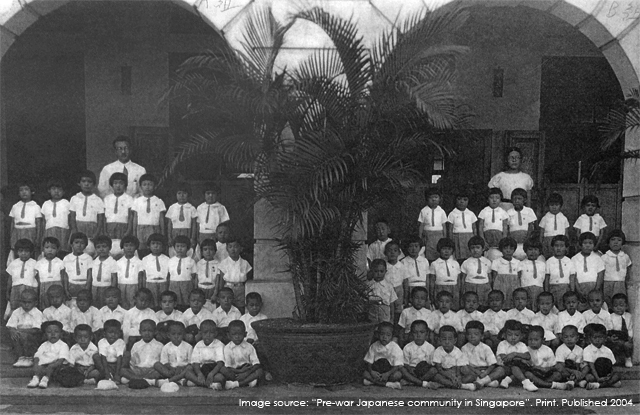 The Singapore Japanese Elementary School in 1931. Jovial times in the elementary school. Battledore match. 1936. Pre-war Middle Road. The Japanese Street. The Japanese community had called it the “Chuo-dori” (which translates into “Central Street”). The recovery of Japanese civilian residents from internment, as documented in the film “Mare Senki”. I am speculating that these were shot somewhere in and around the Japanese enclave along Middle Road, since the two shots of the elementary school mentioned above had presented immediately before this sequence. But I am still unable to identify the buildings in the film-stills here. Lower right: Bowing to the new masters. 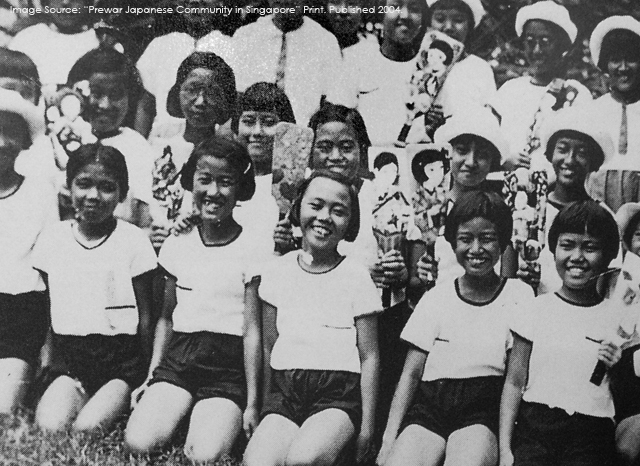 Some of these civilian residents would later serve as translators or administrators during the Japanese occupation. After the end of second world war, they would be repatriated to Japan, and Japanese citizens were to be denied entry into Singapore for the next four years. Alliances were constantly changing. Even till today. (18 Oct 2012: Update – I have found out that the set of film-stills above was indeed shot in and around the Japanese enclave. The location where the Japanese civilians were disembarking from the lorries was along Beach Road — which was still part of the Japanese enclave as indicated in the map presented earlier. A postcard showing Beach Road, c.1920-1930s. The design of the building top of Chin Chin Hotel matched the one in the film-still from “Mare Senki”. So, it can be surmised that the Japanese civilians were indeed dropped off at Beach Road after recovery from Changi Prison by the Kempei Tai, as mentioned by Mamoru Shinozaki in his book. Part 1 – Before and During The Surrender. This is Part 2 – After The Surrender. Part 3 – Prisoners of War. This entry was posted in 1940s, Documentary Features, Japan-produced, Japanese-language Films, Singapore Architecture, Singapore Geography, Singapore History, World War Two and tagged 1942, australian army, beach road, british army, bukit batok memorial, bukit timah, chin chin hotel, chuan hoe avenue, chuo-dori, commemoration of war dead, farrer park, fence, fujiwara iwaichi, general percival, general yamashita, grave markers, Ida Shinbi, indian army, indian independence league, indian national army, japanese cemetery park, japanese elementary school, japanese occupation, japanese street, john little, Kameyama Matsutaro, lorong sesaui, malayan war record, mare senki, middle road, mohan singh, nipon eigasha, padang, purvis street, raffles college, raffles statue, shingaporu, sin chew jit poh ltd, singapore, singapore cricket club, stamford arts centre, supreme court, surrender, syonan chureito, tank convoy, union jack, victoria memorial hall, war dead, waterloo street, world war two, yamashita corps. The Sialor INstitute was called Connaught House. I saw it in the early 1960s. Locaitonj today should be AVIVA Towers (former Temasek Tower), Anson Road. Thanks for pointing this out, Peter. I think there is really a lack of materials, photos and information related to this demolished building. So, it was probably torn down in the 1980s (when Temasek Tower / Treasury Building was built), or earlier?